County highway 10 is now open to traffic. The water is off the road, and the barricades are down. We do anticipate setting the pumps up again after the snow. CSAH 13 from CSAH 60 to the Becker County Line – 2019 Spring Road Restrictions are reduced from 6 Ton to 5 Ton, effective immediately due to road breakups.CSAH 67 from CSAH 52 to CSAH 54 – 2019 Spring Road Restrictions are reduced from 7 Ton to 5 Ton, effective immediately due to road breakups. 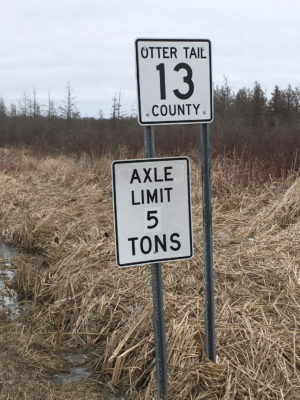 Please be advised that Spring Weight Restrictions on Otter Tail County Highways will go into effect at 12:01am, Thursday, March 21, 2019 and will remain in effect until signs are removed. If you have any questions, require additional information; or if you would like a copy of a weight restriction map, please contact the Otter Tail County Highway Department, or download the map below by right-clicking the link and saving to your device before opening.